Celebration Authority loves to add a twist to typical entertainment rentals, and that includes our performers. If you want your guests to leave with a piece of the party, glitter tattoos are the way to do it. Glitter Tattoos are applied using special glue, glitter and stencils. They are a modern addition to temporary tattoos. You can request for certain types of stencils so the tattoos match your theme. Don’t get stuck with boring wet paint, try our glitter tattoos that make every guest sparkle! 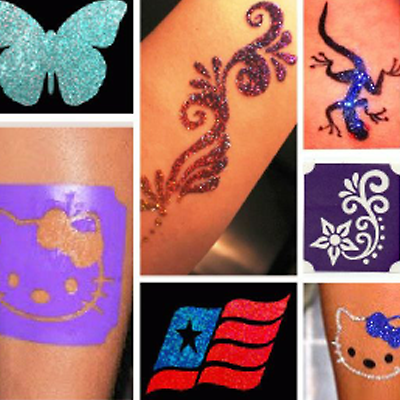 Celebration Authority’s Glitter Tattoo Technicians are pro quality artists and performers, perfect for Fun Fairs, Family Celebrations, Summer Picnics, Corporate Events, College Campus Events, Themed Events, Carnivals, Festivals, Mitzvahs, Birthday Parties, Holiday Parties, and much more. Age Group: It is recommended for all ages!